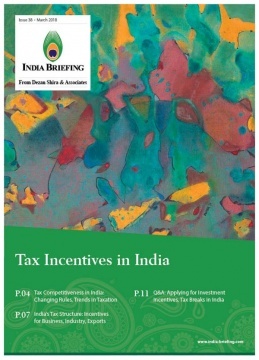 In this issue of India Briefing magazine, we examine India’s corporate tax structure, analyze the latest trends in India’s tax system, and strategies that companies can use to offset their tax burden. We also answer frequently asked questions on applying for investment incentives and tax breaks in India. Foreign investors should note that tax benefits available to businesses in India are determined by economic activity, industry, location, and size of firm. India has prioritized tax reforms and investment incentives as key growth strategies in the last five years. Yet, the benefits of the reforms and relaxations, while welcome, seem limited when looking at India’s complex tax regime. Here, foreign investors must be prepared to offset tax costs with benefits accruing from the lower cost of labor and resources or rapid growth and development of the market. The reason for current tax pains is that India is presently focused on expanding its formal economy, and reducing the imprint of its grey economy. Major reforms – including the Goods and Services Tax, the Bankruptcy Code, and the General Anti-Avoidance Rule – are concerned with bringing more businesses into the tax fold and formal regulatory framework. At the same time, they bring transparency, accountability, and uniformity to the taxation regime in India. For too long, India has grappled with the challenge of tax avoidance, black money, and institutional corruption. Investors and multinational companies looking to establish or expand their India presence will need to factor in this policy direction of the government, at least in the near-term. Analysts forecast that in the coming five to ten years, corporate taxes will scale down, as in more advanced economies. In this issue of India Briefing magazine, we examine India’s corporate tax structure, analyze the latest trends in India’s tax system, and strategies that companies can use to offset their tax burden. We also explain the tax benefits that can be availed by business and stakeholders investing in India – by economic activity, industry, location, and size of firm. Finally, we answer frequently asked questions on applying for investment incentives in India.